Mix the lemon water ice, sherry and seltzer in a soda-water glass. Add the shaved ice. It definitely qualifies as vintage, as it comes from the book Cooling Cups and Dainty Drinks by William Terrington, published in 1869. And through the magic of the Internet, you can actually read the recipe as it was published. It is rare because I don’t think many people have made it. Seriously, when I was researching this drink I did a Google search for “knickerbocker a la madame recipe” and while the first few hits were verbatim references to Dr. Cocktail’s book, the index to this blog was one of the highest hits after those. Never a good sign, since I tend to be clueless. This recipe is paired with the Knickerbocker à la Monsieur, but perhaps one reason few people have made is the good Doctor’s comment “The Knickerbocker à la Madame is a completely different drink, and not as interesting (or good)”. Anyway, in my determination to make every recipe in the book I decided to soldier on. The first challenge was deciphering the recipe proportions. Adding over a pint of liquid to a bottle of seltzer water seems to make a huge drink (more in line with a punch), and I was fresh out of “soda-water” glasses, whatever those may have been. My first order of business was to half it. Since 0.50 pint is a cup, I went with half a cup of lemon water ice and sherry, and 375ml of soda water (I use a Sodastream). The second challenge was to make lemon water ice, which Dr. Cocktail refers to as “basically, lemon sorbet”. I found a number of recipes for “Italian Lemon Ice” or “Lemon Flavored Italian Ice” that seemed to fit the bill. I merged several to come up with mine, and even outside of including it in a cocktail, lemon water ice is tasty on its own. The third challenge was determining what spirit to use. Sherry is a fortified wine from Spain and Madeira is a similar wine from Portugal. I have some sherries, but there are a number of different varieties from bone dry to sickly sweet. I thought about using an Amontillado but then thought it would be too dry to offset the tartness of the lemon water, so I went with a Cream Sherry. Remember, I’m flying blind here. Did you think we were done? Nope – what about that shaved ice? Again, searches turned up that shaved ice is basically “sno-cone ice”, and I don’t happen to own a machine to make it (I subscribe to Alton Brown’s philosophy of no single use kitchen items). I do own a Vitamix blender, and I found two methods to use it to make shaved ice. The easiest method is to filled the blender with ice, and then add enough water until the ice just floats. Blend on high for two seconds. Easy peasy, but you then have to strain the water out of the ice and the ice is still a bit wetter than I’d like. The other method is to start the blender empty on high, and then drop cubes in one by one. This causes the ice to be pulverized along the sides of the pitcher. Repeat until you have enough shaved ice for your needs. My friend Seth suggested freezing the pitcher beforehand to make even drier ice. I was lazy and went with the first method. To bring it together: I made the lemon water ice. I put one half cup of that in a very large glass and added one half cup of sherry. I topped that with the soda water, and I gently stirred until it was incorporated. I then poured it into cocktail glasses over shaved ice. And guess what? It was pretty good. In spite of the faint praise from the Doctor, I liked it. My one mistake was going with the very sweet sherry. If I had to do it again I’d go with a sweet Oloroso. Rating: 4/5. I debated rating this a strong three or a weak four, but as I ended up drinking two and a half glasses of this (Andrea didn’t care much for hers) I went with the four. 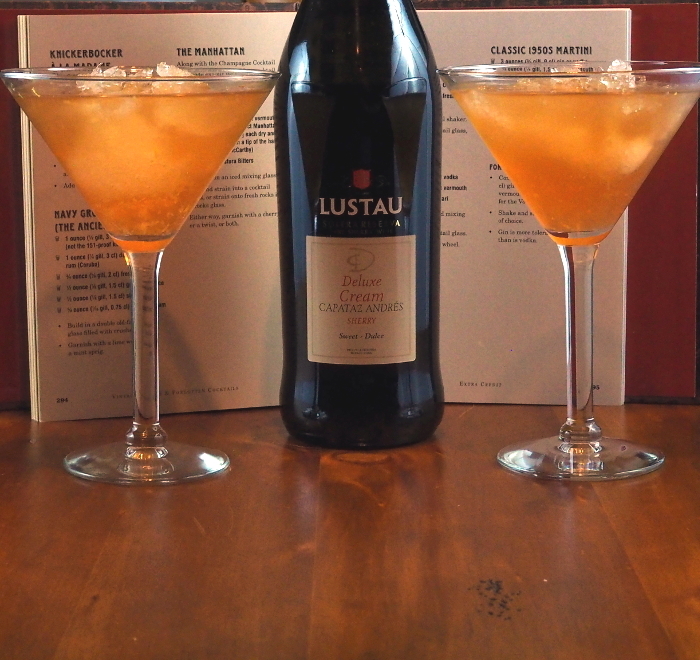 Notes: I used Lustau Capataz Andres Deluxe Cream Sherry but as mentioned above, it was a little too sweet. You want to use a sweet sherry but maybe not something on the scale of a cream.